Malcolm Faed's Blog: Fuses, lots of fuses. This weekend was spent making up fuse boxes. 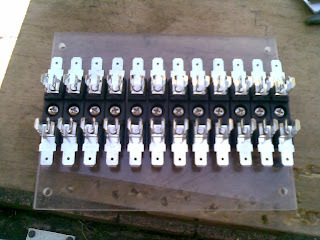 I purchased 60 FHM3AG fuses from Pacific Components . 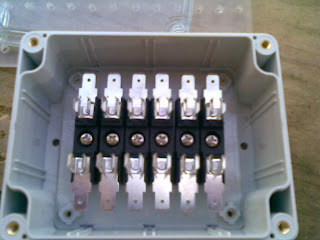 26 of these are to connect to the outputs of the 13 chargers. 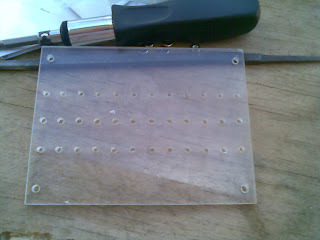 These (actually 24) of them are mounted in 2 ABS boxes on clear acrylic. The final 2 will be inline as they are only +-12 volts. Each alternate fuse has 48 volts between them so before inserting the fuses I will glue some clear plastic sheet between them so they don’t short when fumbling with fuses. I started test charging one set of batteries and unfortunately the charger let the magic smoke out of the output electrolytic capacitor and a diode also ruptured. I have replaced the cap and diode, but the charger still has some problems. Back to e-crazyman on eBay if I cant fix it. Another smaller ABS box has 6 fuse holders for the heater and the 12 volt power supplies to charge the accessory battery.